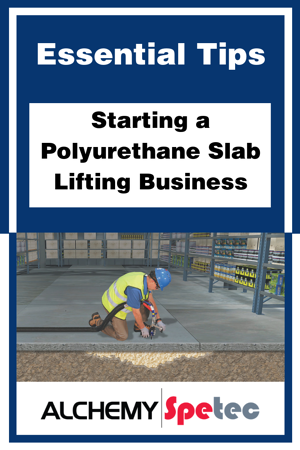 Pursuing the dream of starting your own polyurethane slab lifting business is a big leap. But it's not nearly so intimidating when you're armed with the right information. In this post I'll cover available slab lifting markets, marketing strategies for your lifting business, and estimating materials for a job. The residential market offers tremendous opportunities for the slab lifting contractor. Obviously there are driveways, foundations, patios, pools, and porches. Don’t think residential only includes houses. There are countless opportunities in the apartment and condo sectors as well. Because scenarios for slab lifting are infinite in the non-residential category, we list commercial and industrial together. Concrete parking lots, showroom floors, industrial park walkways and an endless supply of huge warehouse floors are just the tip of the iceberg in this potentially lucrative market. Last but not least, there's the transportation sector. The world is covered with miles and miles of concrete roads, highways, bridge approach slabs, and railroad support slabs. A large percentage of them have settled in one spot or another (and the rest are vulnerable to future settling). Read more in the post Identifying Common Markets for Slab Jacking with Polyurethane. There will NEVER be enough slab lifting contractors out there to address ALL of these current and future slab lifting needs. Your fortune awaits...(IF you know what you’re doing). Professional design, photography and content will help you stay competitive and either depict you as a confident, articulate leader in your field or just the opposite (if it's not well designed). It is also imperative to make sure that your website is Search Engine Optimized. Designing a search friendly site for your industry niche and market location will make a world of difference in the amount of leads you capture via your online presence. Posting blog articles regularly allows you to cast a wide net with lots of SEO friendly post pages. It's also a great way to share your knowledge and build trust in the market as an industry expert. If you offer more value (such as an info-packed brochure) in exchange for contact info, you can increase your leads dramatically. Blogs are a gift that keeps on giving, because the posts stay up and attract new leads forever. Read all about this extremely effective marketing technique in our blog post How to Promote Your Contracting Business with a Blog. Setting up a Google Ads account to target your market and placing ads in local publications are effective ways of getting the word out in your local market. If you’re aware of a specific problem occurring in your area, such as sinkholes, you can even highlight that issue in your advertising. Read more marketing tips in the post Marketing Your Slab Lifting Business. Because you’re putting yourself in front of customers who are actively seeking your services, you can increase your marketing ROI compared to other methods such as cold calling, print advertising, etc. In addition, referred customers are typically less price sensitive than cold call prospects. Referral sites are also a great way to build your reputation by accumulating positive reviews from customers. Read more about this approach in our blog post How to Market Your Contracting Business with Referral Sites. Home shows are a great place to meet potential customers and even affiliate partners. Contractors tell us over and over again that home shows are a GREAT source for leads. Take a look at our blog post on marketing at home shows. Giving presentations at local chapters of professional associations is a great way to network, meet potential customers and lead sources. Look into organizations serving property maintenance professionals, building managers, property owners, real estate professionals, etc. Establish yourself as a local expert and people will come to you when they have slab settlement problems. Through a combination of easy calculations, product information, and some site considerations, you should be able to estimate your slab lifting materials without too much trouble. Fortunately, Alchemy-Spetec has a simple estimating app that allows you to calculate the lifting material you'll need in a few easy steps. Read the blog post on our estimating app for more info. Beyond the geometry required to estimate lifting the slab, you must take into account some job specific considerations. This is where it becomes critical to qualify the volume of material included in your proposal. And just as important, this is where you need to make sure you have included enough so you get the job done right and don’t have to go back to the customer asking for more money. Sometimes that’s unavoidable if you encounter surprises; but by keeping a few considerations in mind this can often be avoided. For help on specific considerations, contact your tech support rep at 404-618-0438 today. Typically for a lifting job without other considerations besides the lifting volume, we recommend adding an additional 10- 15% onto your material estimate to cover yourself. Just make sure you do a thorough evaluation of the conditions and possibilities so you don’t underestimate the job and have to go back to the property owner with your hand out. Read more in the post Estimating Materials for Slab Jacking. Want more information on slab lifting? One of my favorite segments on TV is when the sports analysts stand around and watch film of the previous week’s boneheaded plays. These are the “C’mon man” awards. See a guy fumbling or running the wrong way and these analysts are like, “Come on man, what are you thinking!” It’s a really funny segment. 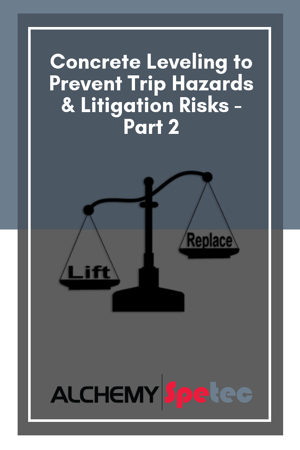 As someone in the concrete lifting industry, it’s impossible not to miss obvious tripping hazards and the methods different municipalities and businesses use to address them. I have frustrated contractors talk to me regularly, letting me know about this job or that job where they didn’t get the sale and some other method was used (or NO method was used) to deal with the problem. So in honor of those methods, here are a few of my How NOT to Repair a Tripping Hazard “Come on Man!” Awards. Names of the perpetrators will be withheld cause I'm a nice guy. 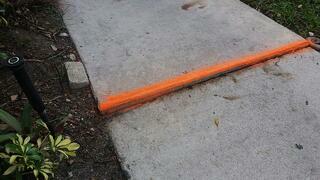 A certain city had their tripping hazard painted with orange spray paint. Our slab lifting contractor offered to do this for free as a demo for the city. What did they do? They sent a crew of four guys out and an asphalt truck and slapped a makeshift asphalt ramp together to bridge the slabs. This is certainly not ADA (Americans with Disabilities Act) compliant and it’s also ugly as hell. Most importantly - it will NOT last. COME ON MAN! These slab transitions were ground down to remove the tripping hazards. At least they didn’t just slap some asphalt on it. 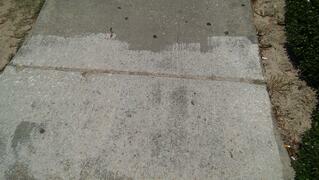 Grinding the concrete exposes the aggregates, and it leaves ugly patterns that will stay visible for years. Not to mention the fact that it doesn't address the underlying sinking problem, so a tripping hazard is likely to appear again. Last time I drove by there the rest area was closed. COME ON MAN! They should have had those slabs adjusted with polyurethane technology. 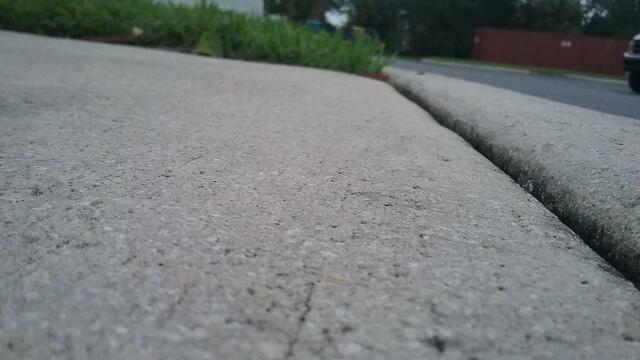 Maybe if they paint this tripping hazard yellow, people will see it and not trip and fall down. How well does that work at night (or if someone is distracted while walking)? This was on a hotel property and there is certainly pedestrian traffic in the evenings along these walkways (not to mention millennials walking around staring at their phones). COME ON MAN! Do they realize that by painting the tripping hazard they are proving prior knowledge of an the issue they didn’t do anything about? 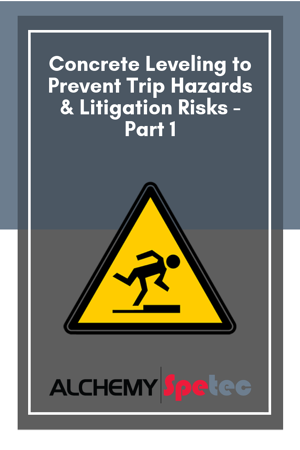 Prior knowledge is a key component in tripping hazard lawsuits. That’s it for this special edition awards blog. 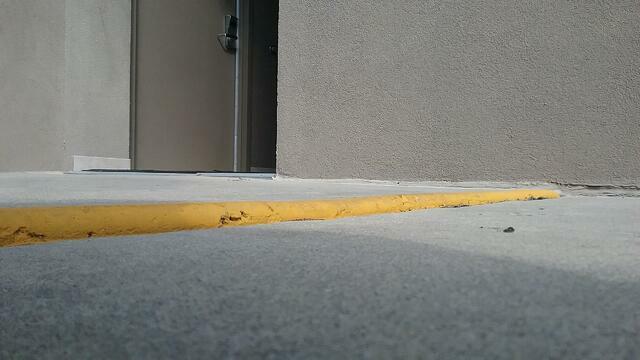 And remember, if you’re a property owner faced with a tripping hazard…COME ON MAN! Repair it correctly. Don’t be that guy! 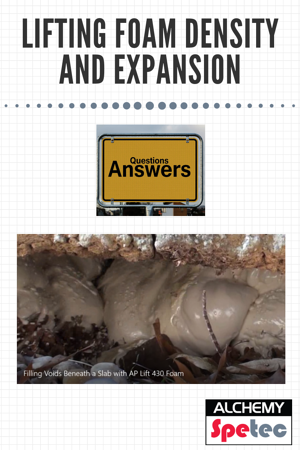 Want in-depth info on leveling sunken slabs? Everyone claims their lifting foam is "the best" on the market (unless they're claiming theirs is the cheapest - which is a red flag to look into the quality ASAP). As a quality leader in the industry, we provide more than vague statements and marketing slogans on this issue. The products are made of virgin raw materials only. They are consistent and clean, with no particulates floating around. Your drum set of material will be consistent from top to bottom. Whether you pump it all in one day or all in one month. No mixing will be required. You'll be able to fill voids, stabilize soil and lift slabs faster. In addition, unlike some other foams out there, these foams have no history of smoke or charring. These foams are certified To NSF 61-5. That means that the cured foam is safe for contact with potable water. Most of the time your foam won't ever come into contact with drinking water, but this certification assures your customers that once the foam cures it will not pose any kind of environmental or health hazard. You won't have to worry about your foam setting up one way this month and another way next month. The NSF certification and the ISO 9001 certification require the exact same formula for every single drum set. We have both certifications. DOT grade foams cure faster, work in wet conditions, and are traffic ready in 45 minutes. Use less material and get less call-backs with foams that meet the standards for Department of Transportation work. Want more information on Alchemy-Spetec products and procedures? One question we get from both property owners and potential new slab lifters is about the difference between polyurethane vs. cement grout. 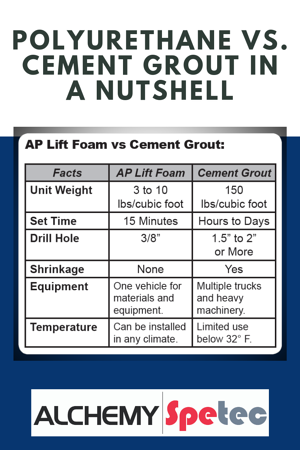 The quick answer is that our AP Lift Foam weighs less, has a quicker set time, doesn't shrink, requires less equipment, and can be installed in any climate. 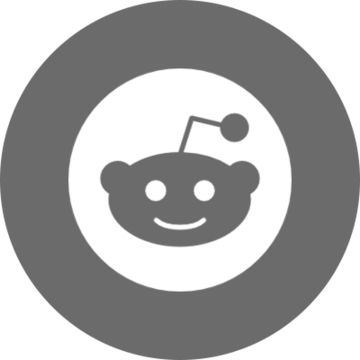 The table included in this post provides further specifics for each claim. If you want even more details on this subject, check out one of my earlier blog posts Polyurethane vs. Cement for Slab Jacking. In that article, I delve a little deeper into the importance of using a lightweight yet strong material, why polyurethane creates less mess than concrete grout, and the importance of using a material with a quicker set time (or cure time) than cement grout. Want in-depth info on the slab lifting process? 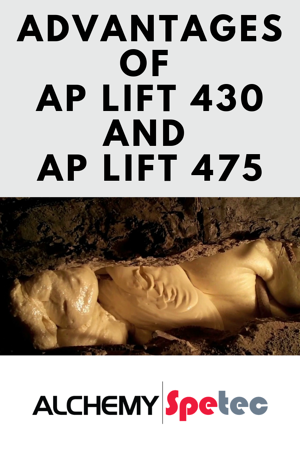 The most common slab lifting foams we sell are AP Lift 430, AP Lift 440, and AP Lift 475. Each foam has a different density and load-bearing capacity. They also have different expansion properties. The higher the density of foam, the lower the amount of expansion (yield). All of the properties on the datasheets are based on lab conditions and free rise foam compression and density testing. Free rise means foam that is allowed to expand in an unconfined state. When foam expands in a confined space, the densities and strengths increase rapidly. 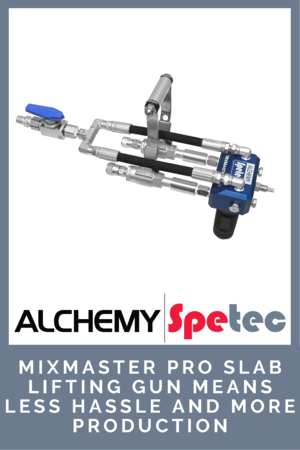 Want more info on Alchemy-Spetec slab lifting products & services? Don’t bring a knife to a gunfight! Sprayfoam insulation guns are made for the simple process of spraying foam at constant pressures. Slab lifting requires a gun that is designed to deal with changing pressures and back pressure without backing up or crossing over. Issues like leaky port connections, constant cleaning, and constant fumbling around with a clamp can drastically reduce production - adding a lot of man hours to each project. Not to mention long nights spent rebuilding and cleaning the gun after EVERY job. Did we mention that feeling in the pit of your stomach every time you have to call in yet another expensive replacement parts order? The MixMaster Pro was designed based on years of feedback from slab lifting contractors working in the field. Every known point of frustration and difficulty has been addressed in this sturdy, single-purpose gun. Further benefits include a lower cost of consumables (you can reuse ports with this gun), beefy check valves designed to handle the back pressure, and a short 10-minute breakdown/cleaning session at the end of each day. Not to mention the fact that this gun is a production BEAST - no leaky port connections, no fumbling with clamps. Watch your man hours on each project shrink accordingly. Did we mention you’ll have less replacement part orders? There are only a few inexpensive replacement parts on this gun - PERIOD. Want to see side by side comparisons with other guns, additional key benefits, and more? Voids beneath warehouse floors can be filled with AP Lift 475 foam. This product is great for slabs that rock and warehouse floors that have begun to sink. The video below shows an example of the product in action. Inside this warehouse, the floors have begun to rock and are unleveled - which can speed up wear and tear on valuable equipment. 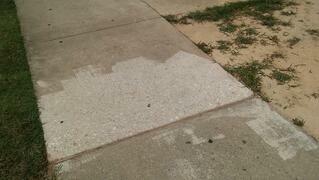 With this powerful polymer and its painless application procedures, unlevel slabs can be repaired at a rapid pace. Take a look for yourself! Want in-depth info on how to repair unlevel warehouse slabs? In the previous installment of this two-part series, we looked at common slab settlement danger zones, causes of sinking slabs, and the many risks of neglecting a known trip hazard. This time around we’ll review the two most common non-polyurethane repair options, and then explore the three most common types of polyurethane slab repairs. Aside from polyurethane repair, the property owner has two other options: replacing the slab or mudjacking it with cement grout. There are drawbacks for both. Messy (requiring heavy equipment and possibly damaging the surrounding area). Mudjacking may be less expensive than replacement, but the property owner is still facing a number of issues. It’s still a messy process. The grout is heavy and can sink over time. The grout can crack and shrink over time. Not an impermeable water tight solution. Polyurethane repair has distinct advantages over replacement and mudjacking. Lighter than cement mudjacking grout and won’t sink over time. Closed cell structure makes it water impermeable. Typically less expensive than replacement. Less time consuming to apply than a mudjacking or replacement solution, and ready for traffic 45 minutes after application. Not to mention the strength of these polymers. For more on that subject, see our blog post Slab Jacking with Polyurethane Foam - How Strong is Strong Enough? Sunken concrete slabs can be lifted back into place with a-two component structural polymer foam designed to work in wet or dry conditions. The expansion force of the foam coupled with the pressure of a PMC proportioner pump can generate enough controlled force to lift virtually any structure back into position within 1/10” of the intended level. Unstable, eroded, or loose soil below infrastructure can result in settlement, damage to the structure above, and of course – trip hazards. Voids can be filled, soil consolidated, and water migration halted by permeating the soil with one of our ultra low viscosity polymer resins. Once the bearing capacity of the soil has been increased with this process (soil has been stabilized), then the structure can be lifted with our slab lifting process. Water erosion beneath slabs can cause voids to form that weaken the structural integrity and allow higher water pressure to develop. Filling these voids with rapidly expanding foam that is designed to react in the presence of water will return the integrity to the structure and prevent trip hazards. We have polyurethane resins designed specifically for this type of application. Whether you’re a property owner looking for a professional to repair trip hazards on your property, or a contractor looking for material and/or technical assistance – Alchemy-Spetec is at your service. Give us a call at 404-618-0438 to discuss your trip hazard concerns. Want in-depth info on concrete leveling procedures and products? Concrete slabs sink for a variety of reasons. The result is an eyesore and possibly a trip hazard that could - in a worst case scenario - result in a serious injury, a law suit and/or death. Lifting slabs with polyurethane foam is safe, fast, and economical. Property owners and managers should learn how to deal with these liability issues NOW with the latest concrete repair techniques and preventative measures. If you’re a contractor, you need this information because it’s critical for YOUR customer – the property owner. 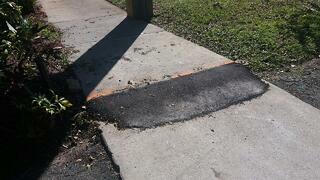 Residential sites can often have driveway, sidewalk, patio, or garage floor issues. Commercial and industrial sites often contain showroom or factory floors made of concrete slab. Warehouse and logistical centers can contain huge floors with massive square footage. Because warehouse floors are often raised off the ground to incorporate a loading dock, they are particularly vulnerable to the formation of dangerous voids underneath. Equipment on surface putting too much weight on slabs. Erosion due to natural causes. Leaking drain pipes and water mains. Improper site drainage or poor water management from downspouts and gutters. Old trash pits from the original construction phase that were too close to the structure. Familiarity with these common causes of slab settling can help a lot when attempting to diagnose the exact cause at a specific location. For more, see our blog post series The Causes of Unstable Soil. Damage to vehicles and equipment. Read that list a few times and seriously consider the very real possibility that one or more of these events may occur when a property owner neglects a slab repair. As experts with many years in the industry, we’ve seen every one of these events unfold after a problem was ignored. In the next installment of this two-part series, we’ll review the two most common methods for repairing a trip hazard aside from polyurethane, and then we’ll review the three most common types of slab repair with polyurethane: slab lifting, soil stabilization and void fill. 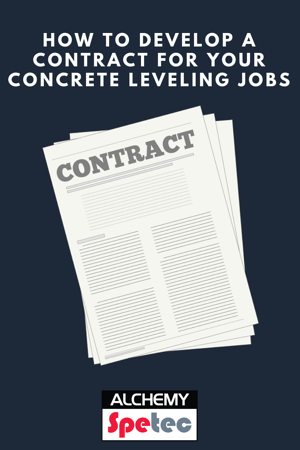 This blog post explains how to develop a contract for a typical lifting job. We’ll cover essential points such as Description of Process and Products, Scope of Work, Scheduling, Items Furnished by Others, Stipulations, Price, Warranty, Terms of Payment and Seeking Legal Counsel for Fine Tuning. PLEASE NOTE: This article covers situations that you may want to consider when preparing your contract. It is not intended as legal advice, is not all inclusive, and has not been reviewed by any attorney. It should not be relied upon as such. Laws vary from state to state. You should seek the advice of legal counsel licensed to practice law in your state before finalizing your contract documents. The slab lifting process consists of the injection of expansive high density polyurethane foam underneath the concrete. This foam is manufactured by Alchemy-Spetec of Tucker, Georgia. This high density foam has a quick cure time of 15 minutes to 90% weight load capacity, does not shrink, is hydrophobic, creates a moisture barrier, and is lightweight. It’s important to spell out the order in which certain events will take place and the time parameters in which you’ll be able to do the work. For example, you may cover points like calling the appropriate agency to locate underground utilities on site before the job starts, coordinating with the engineer (if there is one) during the job, and outlining the days and hours in which you typically work. You can also let them know how long it will typically take you to begin the job after they give you the green light. In this section you can briefly list any items that you expect the customer to furnish, such as access to and from the work area, electricity, water, etc. It’s critical to inform your customer and also cover yourself regarding anything and everything that could go wrong on a slab lifting job. Unlocated plumbing pipes accidentally infiltrated with resin, cracks in foundations lacking steel reinforcement, cracks in slabs, etc. Be clear about what you will and will not be held liable for. Alchemy-Spetec warrants that our resin products will not deteriorate or shrink for a period of 10 years after the date of installation. You need to decide what type of warranty you will offer on your labor. Many of our contractors offer to replace any failed product for a period of 1 year at no cost to the owner, and then at a pro-rated scale after that. Be sure to exclude any damage done by acts of nature such as floods, earthquakes, hurricanes, etc. Spell out exactly how much you will charge for labor and how much you estimate materials will cost. You may want to break down the material cost into a per pound amount, so they have an idea how much extra they will be paying if you have to use more material than originally estimated. Lay out the terms of your compensation, including an up-front deposit amount, how long the customer has to pay the balance. Many of our customers insist on the balance being paid upon job completion, to avoid any collection headaches. Again, it’s important to note that these are just general guidelines meant to assist you in constructing a contract of your own. Laws differ from state to state. Once you have a rough draft completed, we strongly urge you to seek the advice of legal counsel licensed to practice law in your state. An initial rough draft combined with feedback and fine tuning from an attorney will get you to a solid standard contract that you can re-use for many jobs to come. Want a phone consultation to discuss your concrete leveling contract?